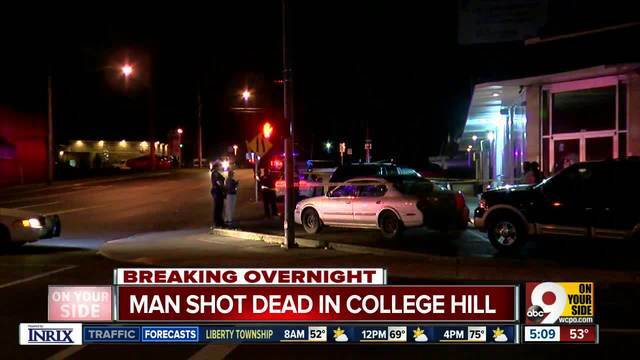 CINCINNATI -- A 24-year-old man was found shot dead just after midnight on Tuesday near the Rustic Tavern in College Hill. District Five officers arrived at 12:02 a.m. at 1191 W. Galbraith Road near the Daly Road intersection for a report of shots fired and found Omar Muhammad lying in a parking lot outside the strip mall. He was pronounced dead shortly afterward. The Homicide Unit took over the investigation. Anyone with information about this homicide is asked to call the Criminal Investigation Section at 513-352-3542 or Crime Stoppers at 513-352-3040 or submit a tip at P3tips.com. Callers may remain anonymous and may receive compensation for their information.